Towards the end of last year, I blogged about The Hummingbird Bakery Chocolate Muffins I'd made for my work's 'Bake Off' and this year, 'The Bake Off' at work is back and last week, it was my turn to bake. The theme for the week was pizza and as much of a pizza lover as I am, I was a little bit sceptical about taking pizza into work as I was worried about the cheese going really congealed and it being a bit of a disaster. 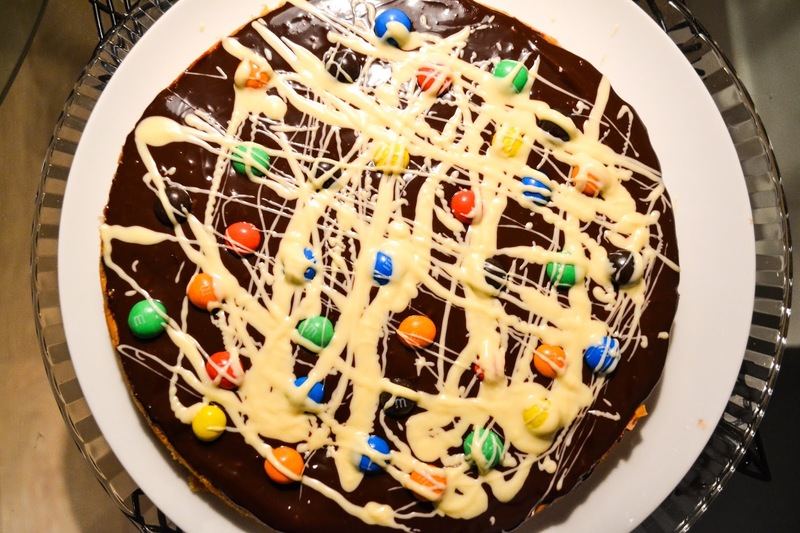 So instead, I opted for a sweet pizza (because y'know I kinda love chocolate) and I thought this would be a bit different and give me the edge over the other bakers. 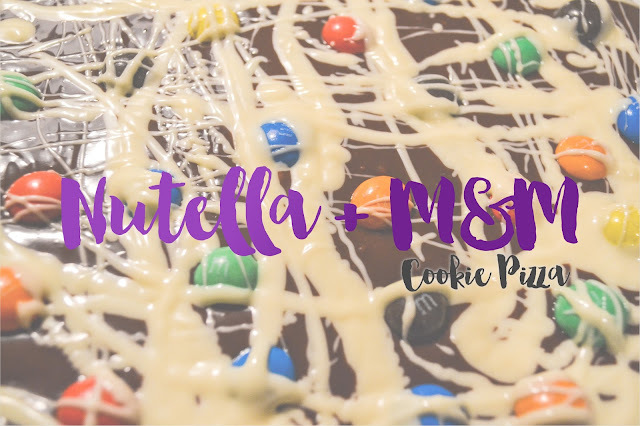 I scoured the internet for sweet pizza recipes and finally came across this this Nutella and M&M Chocolate Chip Cookie Pizza recipe from Food Fanatic and I thought it would be perfect. It was super easy to make as the base is just a cookie dough mixture with chocolate chips and whilst that was baking, I made the nutella ganache. The recipe calls for thick cream and nutella, but I used warm whole milk instead and left it in the fridge overnight to set. The next day, I spread it over the cookie and scattered M&Ms over the top, before finishing it off by drizzling melted white chocolate. I was really pleased with my finished pizza, but it wasn't the easiest to slice into pizza slices (hence the lack of photos of the sliced up pizza). It went down really work and I actually WON, which made me super happy! Now I'm through to the next round of the 'Bake Off' so I'm sure I'll blog about that too. If you're after something that's a bit different as a snack or a dessert for a dinner party, I really recommend this recipe. If you give it a try, let me know your thoughts! This looks absolutely amazing!! Will you be doing any Easter baking ideas?! I'd love to see some after this post!